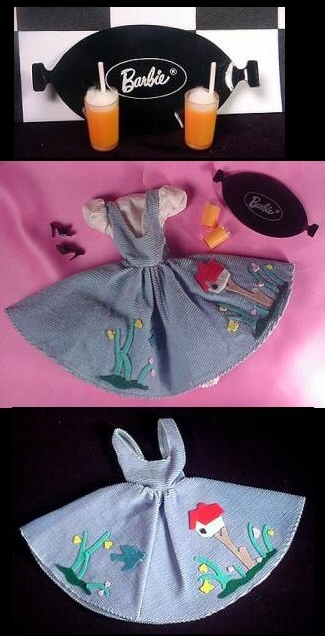 This adorable ensemble includes Barbie’s version of a poodle skirt – her blue corduroy jumper with a white cotton underdress with puffed sleeves and a ruffled skirt. The jumper closes in the back with snaps and has felt appliqués. It is common for some of these to be missing. The one pictured in the bottom photo is in mint condition and shows you how they should look. The rare items in this ensemble are the juice glasses, the “cotton fizz” in the juice glasses, and the rarest of all – the tiny straws in the glasses. The black tray is pretty easy to find – the earliest versions were flat and those are rare. This ensemble also came with black open toe heels – too bad Mattel didn’t figure out how to make saddle oxfords!! Mattel issued a reproduction of this ensemble in the 2006 Friday Night Dream Date Barbie and Ken Gift Set.